Search Is On To Protect Troops From Deadly IEDs Homemade bombs, or IEDs — improvised explosive devices — are the biggest killer of American troops in Iraq and Afghanistan. The Pentagon has spent about $14 billion to try to defeat them. At Aberdeen Proving Ground, north of Baltimore, scientists analyze the latest devices to help figure out how to save lives in the field. Homemade bombs are the biggest killer of American troops — in both Iraq and Afghanistan. They're often referred to as IEDs, improvised explosive devices. And the Pentagon has spent about $14 billion to try to defeat them. 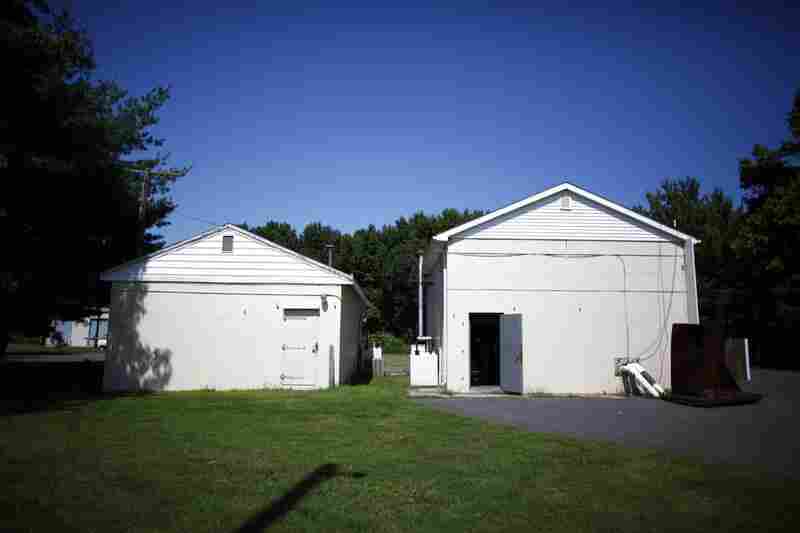 These hardened buildings, known as "bunkers," at the Army's Aberdeen Proving Ground provide shelter from the nearby bomb testing site. The Aberdeen Proving Ground is the Army's oldest active test site, where thousands of explosive devices have been detonated over the years. 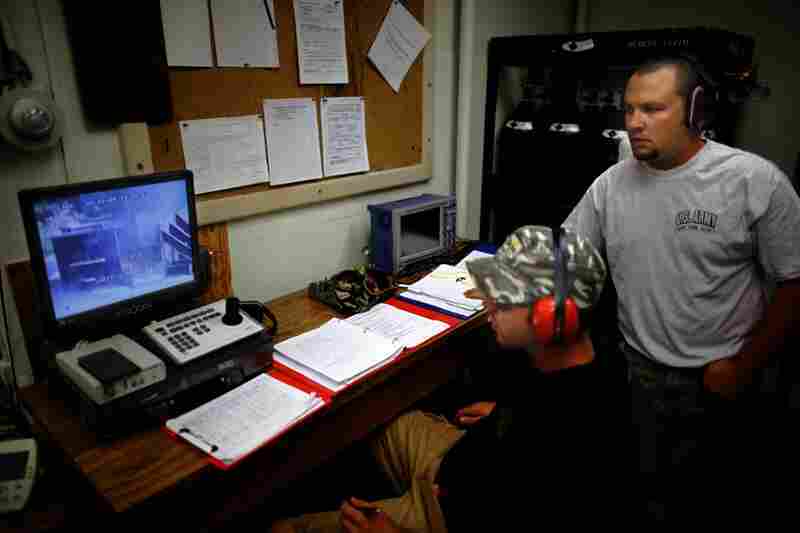 Inside a bunker, explosives experts watch a live explosion on closed-circuit television. 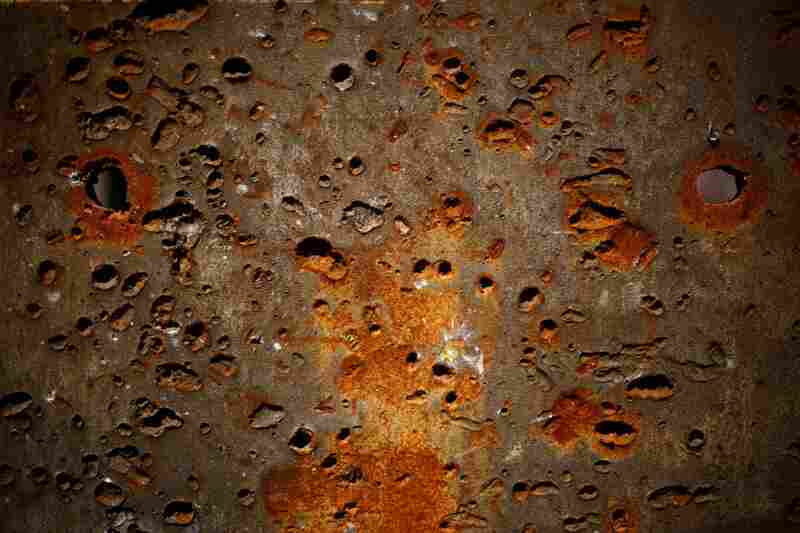 A scarred blast wall bears witness to the thousands of munitions exploded here over the years. Holes in an Aberdeen blast wall appear like eyes overlooking the site. 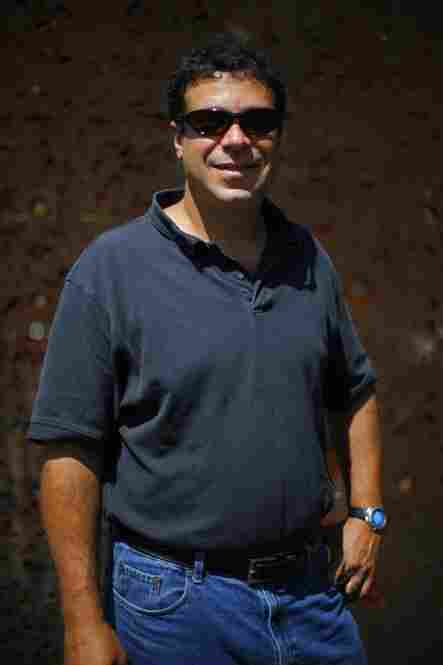 Scott Schoenfeld, a civilian scientist, studies the effects of improvised explosive devices, or IEDs, and develops strategies to counteract them. 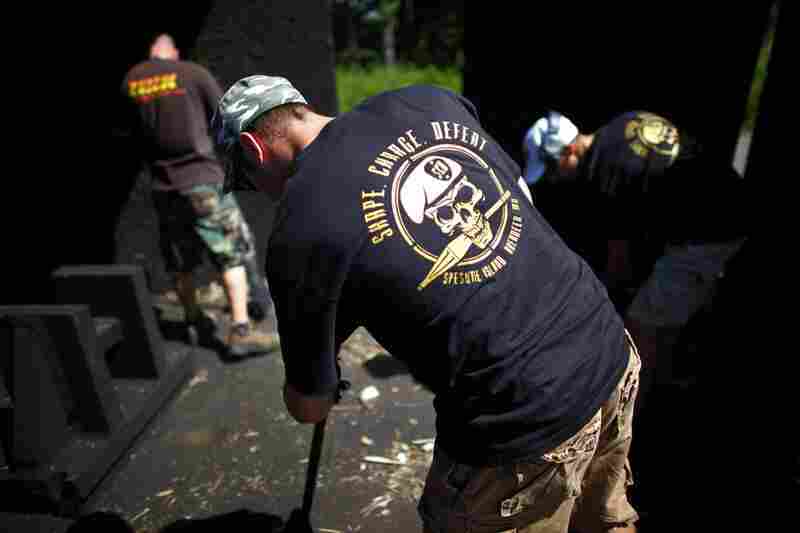 An explosives team sweeps up after a blast shattered a wooden bench into unrecognizable splinters. 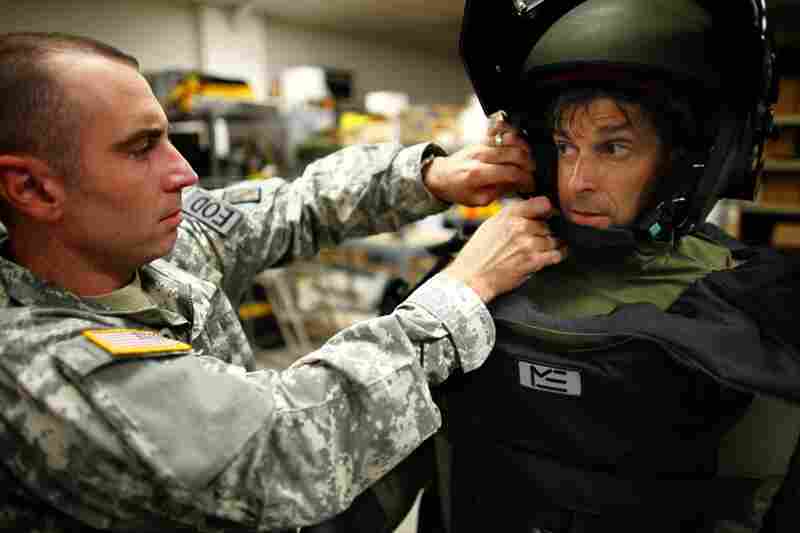 NPR reporter Bruce Auster tries on an 85-pound bomb suit worn by explosives specialists in Iraq and Afghanistan to approach and defuse bombs. The helmet alone weighs 12 pounds. If you lose your balance, Auster is told, it's better to let yourself fall. The weight could snap your wrists. The bomb disposal team at Aberdeen is under the command of Brig. Gen. Jeffrey Snow. One of the places where the military and scientists are looking for ways to save American lives is Aberdeen Proving Ground, a sprawling Army base north of Baltimore. Warning signs are posted everywhere: Danger. Firing in progress. When red light is flashing, no admittance. "It looks like a disaster area," says Scott Schoenfeld, a civilian scientist, referring to a test site that is little more than an open field dotted with scarred blast walls. Thousands of explosive devices have been set off here over the years. Schoenfeld detonates another device on this recent day — part of his research on what happens when bombs blow up and how they do their damage. "That's been my life for the last five years," he says. "Constant new devices, understanding what they do — and it's a cycle." That cycle works like this: A roadside bomb goes off in Afghanistan or Iraq. The American side figures out how to outsmart that kind of IED — maybe by jamming the radio signal that triggered the bomb. Then, insurgents come up with a new design, and it is back to the drawing board. "The key to understanding the IED, it's the 'I' — it's the improvised part," Schoenfeld says. "There's no rules here, there's no set configuration, there's no one way that this is going to happen or be deployed against you." On this day, Schoenfeld is studying how one bomb design penetrates the thick armor on combat vehicles that American troops use in Afghanistan and Iraq. From the safety of a firing bunker — a small one-room building, crammed with computers and wires — observers monitor the bomb site on video. The bomb is just outside, about 50 yards away, sitting on a step stool on the other side of a blast wall. After the area is secured and bomb fragments have stopped raining down, Schoenfeld wanders over to where the blast took place. 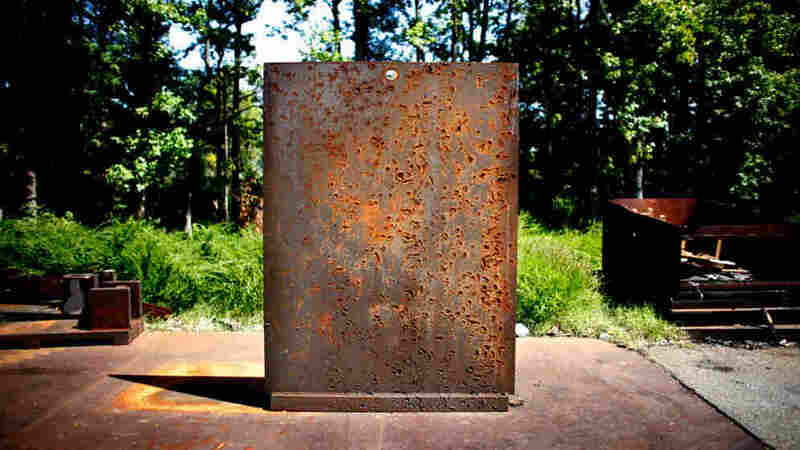 Picture a thick black wall — with a hole in the middle that lets some debris fly through. On one side of the wall — where the IED had been — the step stool has been obliterated. 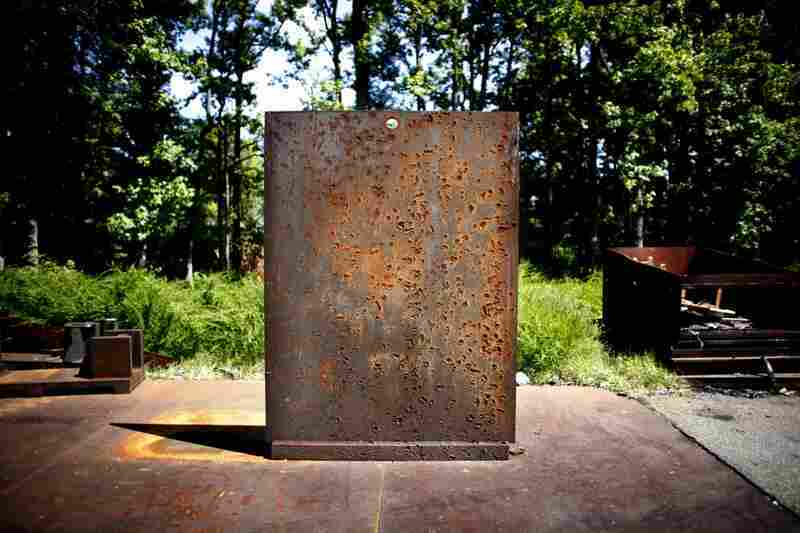 The other side of the wall is called the target chamber — that's where the armor is tested. "So the fragments and debris are flying through here," says Schoenfeld. "We have the high-energy X-rays — we can get a real-time image of how those are all interacting." The X-rays peer through the flame and smoke to capture the moment when the IED fragments hit the armor. "It's just like taking a picture at the dentist's office," Schoenfeld says. That information about how bomb fragments hit armor allows the military to design better armor for its vehicles. But it's only one part of the IED fight. "We are the last line of defense," Schoenfeld says. Another aspect of the work being done to stop IEDs is taking place at a trade show in Virginia. Erin Piateski, who works for the organization the Pentagon set up to try to stop IEDs, is meeting with contractors who are pitching their ideas. Some of their proposals — robots and other gadgets — are pretty high-tech. But chasing expensive solutions doesn't always work. "What tends to happen in the IED world is they start out extremely simple, and they become more sophisticated," Piateski says. "And then as our countermeasures defeat the very sophisticated sorts of IEDs, they tend to go back to something very simple." It turns out simple is often harder to beat. Piateski has with her some small boxes filled with what look like throwaways in a household basement. They are sample IEDs. One design uses a pair of old cell phones: One phone would be placed with the explosive; the other with the insurgent. The insurgent calls the phone with the bomb, setting it off. How do you stop it? Radio jammers. "If the cell phone that is with the triggerman cannot communicate with the cell phone that's in place with the device, then obviously the device can't be detonated," Piateski says. Then, there's an even simpler kind of IED — a pressure plate made of two thin hacksaw blades. "It's two pieces of metal — you have these wooden spacers at the end keeping the metal apart and it's connected to a cord — and that's it," she says. A vehicle that drives over it sets off the bomb. How to stop this one? You have to hope you spot it, Piateski says. "And then you can bring a bomb squad team to come in and defuse it." Back at Aberdeen Proving Ground, members of a bomb disposal team show off just how heavily outfitted they are — the bomb suits weigh 85 pounds. The helmet alone weighs 12 pounds. Instructors warn operators wearing the suit and helmet not to catch themselves if they fall over. Stick out your arms, they warn, and the weight of the suit will snap your wrists. 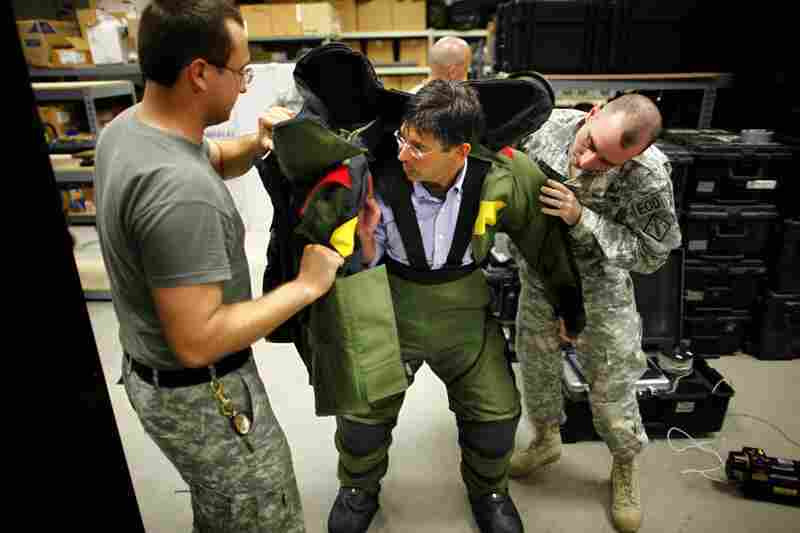 The dangerous work happens when soldiers in Iraq and Afghanistan have to don these heavy, hot suits to deal with explosives. Sometimes they dispose of the bomb, or detonate it. Usually, though, it's better to try to disarm the IED so they can learn about it. Bombs have their own signature — and if they can read it, these soldiers play their part in the cat-and-mouse game. "Where do these components come from? OK, I mean, they've got serial numbers, stuff like that," says Brig. 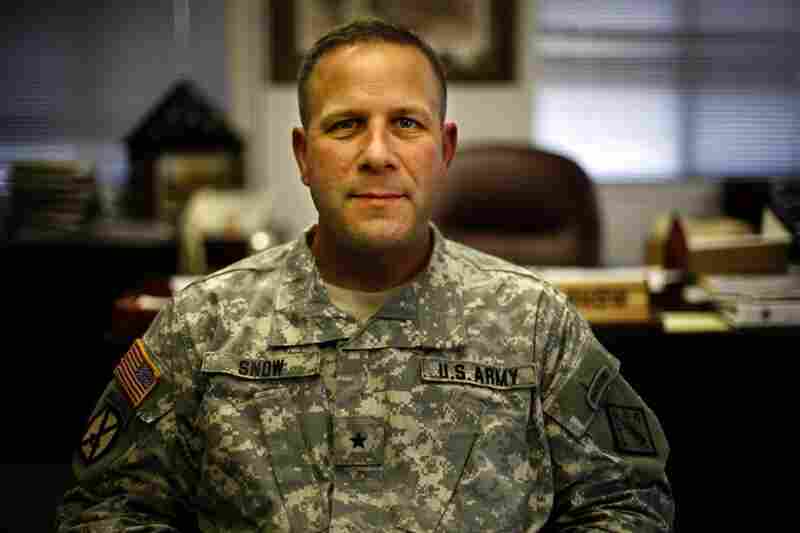 Gen. Jeffrey Snow, who commands the bomb disposal team at Aberdeen. "Being able to trace something as simple as tape to components to bombs — I mean, it's pretty powerful." Powerful, because that information from the battlefield is fed back to Aberdeen Proving Ground, where scientists work to come up with better armor to protect the troops.